Gaming specialist Razer did something rather unexpected earlier this month by eschewing the fertile laptop and peripheral ground for an altogether different launch. That different was a premium smartphone that broke with high-end homogeneity and packed some nifty gamer-specific technology in the audio and visual fields. Enter the £699 Razer Phone. What does Razer know about a premium smartphone that incumbent heavyweight players Apple, Samsung, Huawei, Sony, HTC, et al, don't? That's a legitimate question whose provenance lies with Razer's acquisition of phone maker Nextbit earlier in the year. Razer liberally takes Nextbit Robin's design DNA, fuses it with its gaming mojo, adds some audio sauce by way of its purchase of THX, and then aims squarely for the gamer by using a novel Sharp screen imbued with ultra-high refresh rates and in-house adaptive-framerate UltraMotion technology. That's what the company wants you to believe, so let's see how well these claims hold true. 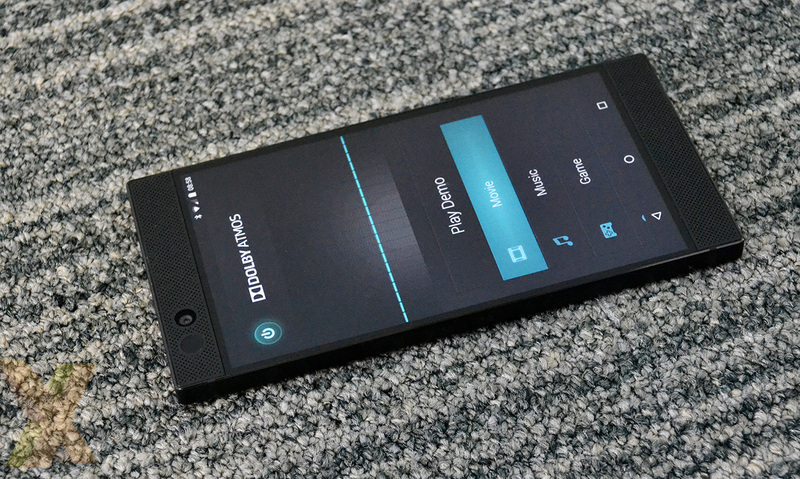 The design cues from the Nextbit Robin are unmistakable. 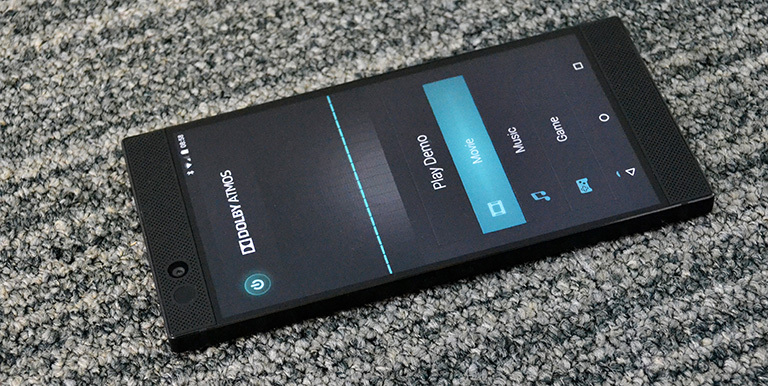 Razer's phone has a muscular look engendered by a rectangular design whose 5.7in, WQHD (2,560x1,440) screen is amply bookended by a couple of beefy front-firing speakers, and these two features combine to offer class-leading technology - more on them later. There's little question the design draws parallels with the rest of Razer's hardware portfolio, particularly its range of laptops, and users of the kit will immediately feel at home with the phone. The matte black finish, solid in colour the whole way around, also has tenuous comparisons with earlier Sony Xperia handsets and recent Nokia Lumia models, too. There's no mistaking the heft of the handset, either, as at 158.5mm x 77.7mm x 8mm and weighing in at 197g, its sheer scale requires some getting used to if you're coming from a mid-range handset. That said, it's very close in proportion to my Huawei Mate 9, but the Razer feels larger due to its squared-off design and consequent lack of tapering around the edges. No problem if your hands resemble shovels, but those with smaller, slender digits may find it awkward to obtain an optimum grip. Perhaps the main reason for maximising internal area is the large 4,000mAh battery residing within. There are phones with bigger batteries, most notably multiple models from Xiaomi, though as Apple has demonstrated repeatedly, it isn't the size of the battery that ultimately counts, it's the quality of software optimisations. As you will see later, battery life is one area where Razer isn't able to lead. Razer positions two protruding circular control buttons down the left-hand side and another, indented on the right, which doubles duty as the power button and fingerprint reader. However, whilst the left-hand duo are located where I'd expect them to be, positioned just under the fingertips in a neutral grip when using the right hand, the dual-purpose fingerprint button feels a tad too low - you either use the middle of thumb or arch the thumbpad down; it would make more sense 2cm higher up. There's little else to punctuate the monolithic edge styling other than the obligatory USB Type-C charging port on the bottom that supports Quick Charge 4+. That means there's no headphone jack, but it's not the surprising drawback it may seem at first glance. Razer bundles in a USB Type-C to 24-bit digital to audio convertor (DAC) ending in a traditional 3.5mm jack, which makes sense given the audio credentials under the hood, though it does mean the need to carry an extra adapter around. The only other interruption is a front-facing 8MP snapper and video camera. Around back, Razer installs two side-by-side 12MP cameras, one with a wide-angle f/1.8 lens and the other a more standard f/2.6 that also has a 2x optical zoom and phase detection. That's regular fare for a premium handset and both are used in tandem, yet unlike the screen and audio, the camera quality isn't as good as rivals. 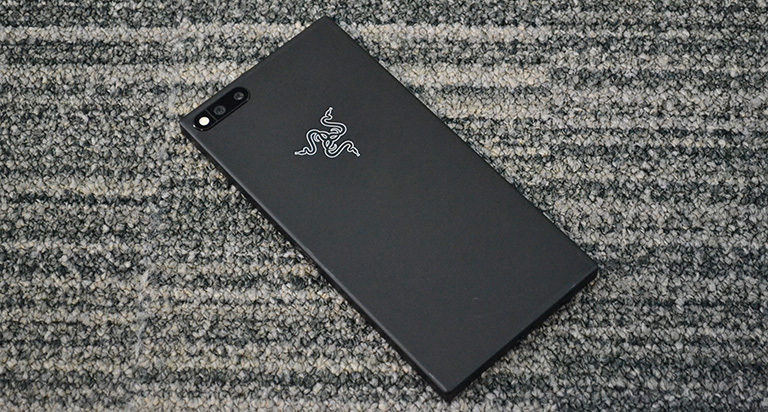 Keeping it plain, the only visual indication that this is indeed a Razer phone comes from the slightly raised in(famous) tri-snake logo near the snappers and LED. In fact, so similar is the look and feel on both sides that getting the orientation exactly right requires you to visually examine the phone for the first few days, keeping the camera lenses on top. I lost count of the number of times that my thumb didn't a) touch the fingerprint sensor correctly and b) was pressing the two buttons on the other side because I had it upside down. In a sea of ultra-stylish handsets with two-tone finishes, silver accents and tapered edges, Razer's more industrial look and feel is refreshing and different, though I don't know long the pristine paintwork will last around the edges - just a few days' use has already made the corners shiny.